A major update for the iMessage application is scheduled to roll out on Apple hardware September 2016. The update integrates features such as rich links that are available on other messaging applications like Facebook Messenger or What’sApp. Apple Messages, also known as iMessage or iChat, is a messaging application that comes standard with all Apple devices. The update will be included with the launch and upgrade from iOS 9 to iOS 10 as well as a duplicate/similar update that will occur on the Mac OS X side of the Apple Messages application. What’s Emojification and Tap Back? Emojification is the future of all instant messages. Emojification includes moving GIFs and extra-large emoji when you send them by themselves with no other text. Emoji are suggested as you type (including the emoji in the suggested spelling area of the iOS keyboard). Within large bricks of text, you can tap and replace keywords with suggested emoji as well. The Tap Back feature allows you to quickly respond to messages with an instant emoji. Rich links is the term used when you share links from websites and other Facebook-like content. Rich links add photos and captions from the website they are linking to so that the text is visually appealing instead of being a long HTTP address designation. Screenshot courtesy of Apple Messages application. Example of rich link content. In-line video allows you to watch online video content within the Messages application without being forced into a different application’s full-screen view. This makes watching video snippets you send and receive quick and painless. With the Messages update, Apple Music users will be able to share a playback link to a song of their choice from their personal library. This allows message recipients to listen to the same song as the message sender. This link offers playback only while the message sender is playing the song and does not allow you to download a copy of the song for your own library. The new bubble effects feature allows users to change the size and text of the message bubbles to make messages stand out over the thread. Another bubble effects feature allows users to add a visual effect called “slam” that makes the phone, well, slam. It technically makes the phone vibrate differently and makes a different sound effect as well as different visuals. Most likely this part of the feature is intended to be used when texting to gain someone’s attention immediately. What are handwritten and drawn messages? The new Messages application will have a button on the keyboard that allows you to switch to a touchpad type area. This area is where you can use your finger or stylus and/or Apple Pen if you are an iPad Pro user to make quick sketches or scribbled notes. The touchpad/drawing surface can be used to edit photos as well! What are Digital Touch interactive greeting cards? Like the Taptic Engine built into the new MacBooks, iPads, iPhones, and AppleWatches, the Messages application now allows you to send greeting cards like the ones that can be sent between AppleWatch users. You can even share your heartbeat with the people you love. The Messages application now also has a privacy setting where you can send invisible messages so the content you send is more secure. When an invisible message is sent, a blank bubble is displayed, and you can swipe the bubble to the left to reveal its contents. This feature is designed to work with both text and multimedia messages. 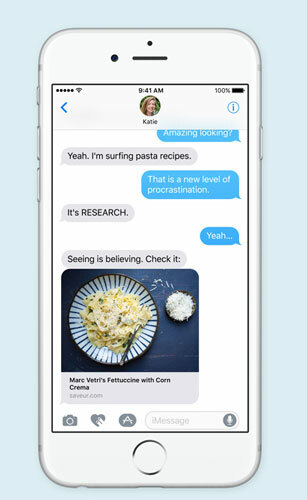 Because more than 200,000 iMessages are sent every second, this new string of features is intended to keep users happy with the built-in application and to keep them from turning to third-party applications such as Facebook Messenger, Google Hangouts, and What’sApp. Talks of future integration with these and many other applications is in the works. Because the code has been opened up to outside developers, plugins and additional features will roll out regularly for the new version of the Apple Messages app.